Qualified e-signature - Is your e-signature qualified and verifiable? Qualified e-signatures: Here's how to check if your e-signature is qualified and verifiable in 3 seconds. E-signatures are not created equal. How do you tell apart a non-qualified e-signature and a qualified e-signature with your bare eyes? In this article, we’d like to show you how you can do just that in 3 seconds. Is my document really signed? How can I prove that my document has not been modified after signing? This is important because you don’t want to put your business at risk without knowing it. There are different trust levels on e-signatures. And unfortunately, we know that 70% of existing e-signature providers in Sweden don’t follow best practices. Depending on your current solution, you may either have the standard form of e-signature, the advanced, or the qualified form of e-signature which has the highest trust level. Why is it important to if your signed PDF contracts contained qualified e-signature or not? It baffles our mind how many companies out there are still using “watermark e-signatures” without knowing the real consequences of doing so. Perhaps the CEOs or business owners of these companies are unaware that the e-signatures they are using are not qualified e-signature. It is very costly and complex to provide verifiable and qualified e-signature. Serious vendors will go through the process because having unqualified e-signatures put the business at very serious risks. So why is it important to check the validity of your signed PDF contracts? How to check if your e-signature on your signed PDF contract is qualified and verifiable in 3 seconds. If you have a signed PDF contract and want to identify your e-signature trust level, here’s a quick way to check if the signature is both qualified and verifiable and what it means to you. Step 2 – On the blue bar at the top, do you see A, B or C? Your e-sign provider has identified the signers but your document has not been signed! Signers have been identified, and the document has been signed. 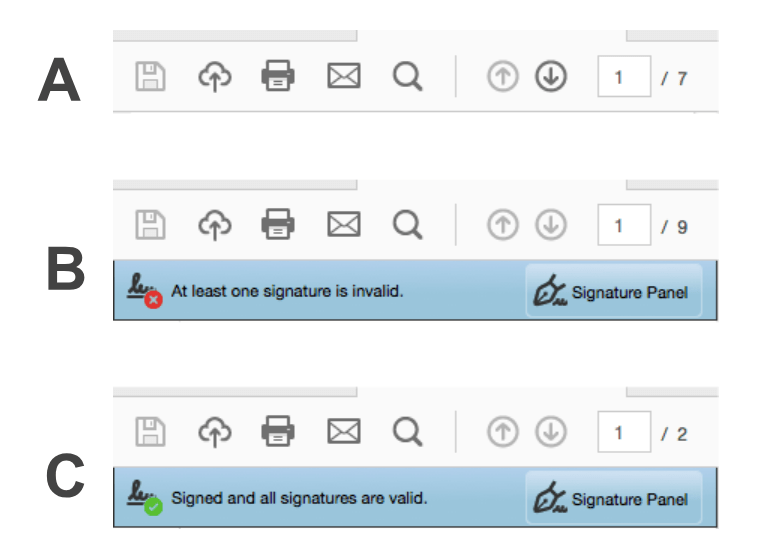 But you can’t easily verify the signatures independent of your e-sign provider. Identification, signature, and membership in ‘Adobe’s Approved Trust List’. The signed PDF document has a qualified e-signature and can easily be verified independently of your e-sign provider. This has the highest trust level of e-signatures. Learn more about e-signature here or contact us to help you evaluate your current e-signature practices. PS: Hej våra svensk språkiga läsare. Här kan ni läsa mer om e-signering på svenska.